Distance makes no difference. It seems that way for three families who drive to Peterborough from Oakwood, Campbellford, and Cobourg each week so that their sons can play for the Kawartha Komets Special Needs Hockey Program. Christopher Erhart, Ian Carswell, and Andrew Avery all suit up for the Komets’ Junior team, coached by Steve Cole. Louise and Tony Erhart, from Oakwood, are thrilled that nine-year-old Christopher has found an organization that gives him an opportunity to make new friends. Christopher was diagnosed with tuberous sclerosis and has non-cancerous tumours in his kidneys, his brain, and on his skin. He has an intellectual disability and has seizures which are controlled by medication. Tony tells us, “The Komets have afforded Christopher an opportunity to play in a non-judgmental atmosphere where there’s not a lot of rules.” Bobby Orr and Sidney Crosby are Christopher’s heroes. At the Special Hockey International (SHI) tournament in Michigan last May, Christopher spent as much time in the pool at the hotel as he did on the ice. As soon as Tony and Christopher arrived at the hotel, they donned their swim suits and headed for the pool. Watching Christopher taking a face off is a sight to behold. He looks like a miniature NHL center. The stance, the concentration, the anticipation! Sandra and Jeff Carswell drive from Campbellford with Ian, age 14, who has Down syndrome. When she found that there were no programs in their hometown for children with special needs, Sandra sent a Facebook message to a parent who is a part of the Down Syndrome Association, and in reply received a link to the Komets website. The rest is history. 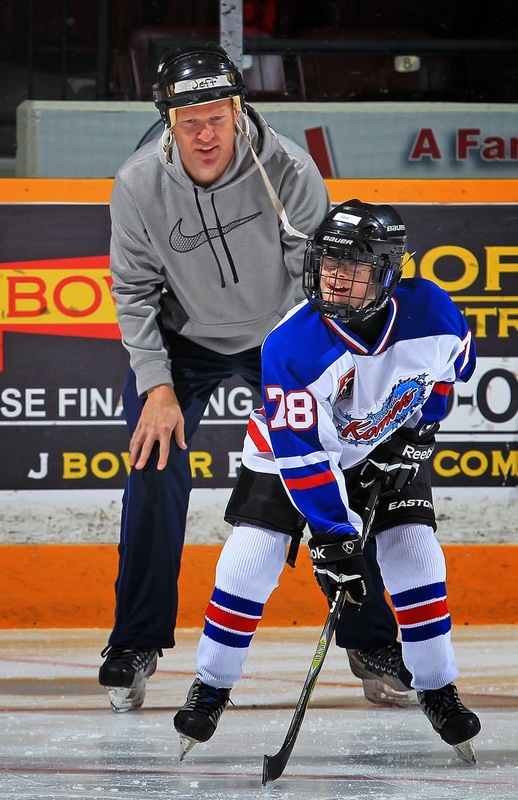 Jeff is an on-ice volunteer with the Komets and gets great enjoyment watching Ian improve his game. As Ian leaves the rink each week he’s on a mission. The Carswells make a regular stop at McDonald’s to pick up a cheeseburger for their son. Julie and Dave Avery drive from Cobourg to the Evinrude Centre on Saturdays to give Andrew a chance to excel at his game. He’s now in his fourth season with the Komets. Andrew is nine years old and was diagnosed with Asperger’s Syndrome at four. Though incredibly bright and creative, Andrew struggles socially, becomes completely immersed in topics of interest, and is prone to intense anxiety. “Every time he suits up, I get a bit emotional. It’s about so much more than hockey. It’s what everyone deserves to have. A place to feel not just accepted, but celebrated — challenges and all,” says Julie. 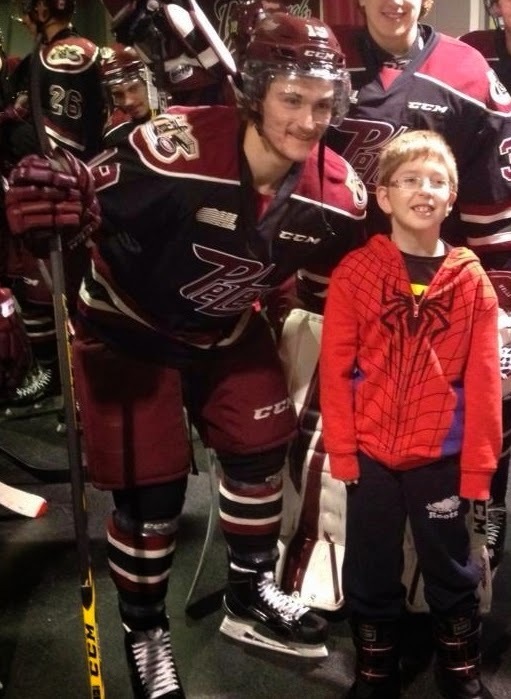 The Kawartha Komets annual fundraiser with the Peterborough Petes has afforded Andrew the opportunity to meet and connect with his fellow Cobourg native, Josh Maguire. Christopher, Ian and Andrew will travel to this year’s SHI tournament in Ottawa in March, forging new friendships and spending a lot of time in the pool, I’m sure. Distance makes no difference to the Erharts, the Carswells, and the Averys. Sitting in the stands and watching their boys have the time of their lives makes it more than worth the drive.